Charlotte's attacks have everyone on high alert everyone except Lee Fisher, the closeted son of the US president. Lee has other things to worry about, like keeping his Secret Service detail from finding out about his crush on Nico, the eccentric, Shakespeare-obsessed new boy at school. And keeping Nico from finding out about his recent suicide attempt. And keeping himself from freaking out about all his secrets. As Lee races to save himself, uncover Charlotte's plan, and figure out if he can trust Nico, he comes to a whole new understanding of what it means to be alive and what makes life worth living. My thanks to Jim for the heads-up on this title. 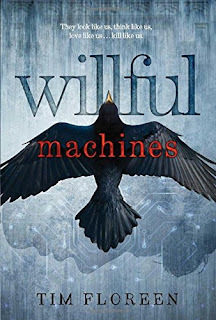 Add your review of "Willful Machines" in comments! I think I saw this one in my library's ebooks recently. Sounds interesting.